The SOTA Yahoo group had been alive for some weeks with posts from quite a few activators, suggesting that this would be a great weekend for lots of SOTA activations…a party! I thought to myself that it had been awhile since I had been out and that this weekend might be a good time to go out and while I was at it, I might as well camp overnight and knock over a couple of summits. With that in mind, I asked Jeff VK2XD if he might be interested again and he jumped at the chance, penciling it in on the home calendar. The next decision was where to go. 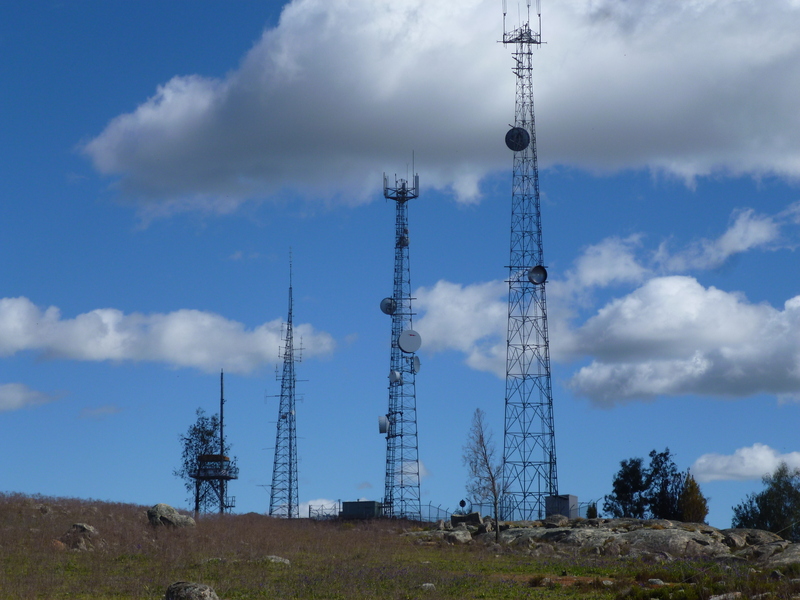 Many years ago, the Radio Club (WARC inc) used to regularly go to Mt Granite (or Granite Mountain) for the John Moyle Memorial Field Day – a radio contest where stations go out in the field and operate over a 24 hour period. Anyway, by 4WD it is relatively easy to get to and about 150km from home so I thought that would be a good place to go and it is possible to camp on the top. So, my plan was to head out on Saturday afternoon with the view of activating the summit at around 4.30pm so I could also take advantage of some European DX and perhaps some Summit to Summit activity with these stations. Then we would camp overnight and head down in the morning prior to the UTC day rollover and then drive on up to Pilot Reef Mountain, which I had never been to. I planned to activate it both sides of the UTC day and then have some lunch and head home. That was the plan! As the time got closer, the weather reports started to make me nervous. Now the weather bureau (BOM) has been wrong before and so I hoped upon hope they may have got it wrong again. The forecast was for high winds and rain – up to 20mm in Wagga and widespread. This was initially forecast for Saturday during the morning but the closer to the day, the further this was put back. I thought that if it was really bad by the time I wanted to leave that I might just cut my losses and go up to Mt Flakeny about 12km from home for the night or if it was really bad, cancel it all together. Now, Friday was a very hot and windy day with total fire bans and a request from RFS (Rural Fire Service) to stop harvesting. It was the sort of day that the smallest spark could have turned a lot of country black very quickly. In fact, as it turned out there was a major fire in our region that meant I was called out to RFS HQ in Fernleigh Rd for a stint manning the phones in the late afternoon. This could have potentially seen the cancellation of my trip on the following day but the good guys (and girls) with the trucks and fire hoses managed to have it under control in a few hours. As it was, that put paid to a Ham exam I was intending to assess, but that’s another story. It was predicted that the weather change would start coming in late Friday and indeed it did with the temperatures dropping from the low 40Deg C mark to the mid 30’s in a matter of an hour or so in the early evening. Saturday dawned with an overcast morning but still relatively warm. It remained that way all throughout the day and as it looked like any rain would hold off until the evening, I decided to proceed with the main plan and picked up Jeff at about 1pm. The drive up was quite uneventful until we got into the Bago Forest proper. As we commenced the main descent we noticed the track was littered with horse manure and it wasn’t long before we saw some of the famed Tumbarumba brumbies. First we spied a lone horse followed soon after by about 6 of them grazing in the bush. Whilst they are feral animals, I dont sort of look on them like that, whereas wild pigs, goats, dogs and cats are definitely in the feral category. To me, it’s always great to see that sort of wildlife. Also managed to spy some of the really beautiful mountain parrots. We soon arrived on the edge of the activation zone (within 25 vertical metres of the summit) at about 3.30 pm and it was here I told Jeff he could drive to the top and I would don my pack and walk up which I duly did. Whilst not far, the last part is quite steep but I felt the benefit of my weekly walking/jogging and wasn’t too puffed by the time I got to the top. It was raining lightly on and off so we set to and erected the squid pole and radio and batteries ready to operate. The wind was absolutely howling and the temperature whilst cool, wasn’t too bad and had only forced me into a jumper and raincoat so far. During the past week in my spare time I had constructed a lightweight 1/2 wave 20m end fed vertical. I copied Phil Barnard VK7JJ’s antenna found here at http://www.perite.com/vk7jj/squidpoles.html. I used the light weight wire Peter VK3PF had sold me some time back and following the rest of the instructions managed something like Phil’s end product. Although, I still wasn’t totally happy with the SWR at 1:7:1 but it was better than nothing and if the worst came to the worst I could always put my tuner on it. Now, erecting long, light weight fibre glass poles in high winds can be fraught with danger especially if one overloads the pole which I did by having both the helically wound vertical and my linked dipole and coax on there simultaneously. Next moment the whole thing came crashing down in the wind and the pole was now in 3 pieces. On to plan B and out with the ‘hundred mile an hour’ tape to fix the pole and to attach the link dipole. I scrapped the idea of the vertical and proceeded to activate the summit on 40 metres on the dipole where I made 31 contacts. Jeff logged for me and was extremely busy writing for the next 45 minutes. That’s how long it took to exhaust the number of 40metre chasers. We then dropped the antenna and tried 30metres without any luck and so I switched it over to 20metres. This was a whole new ballgame for me. 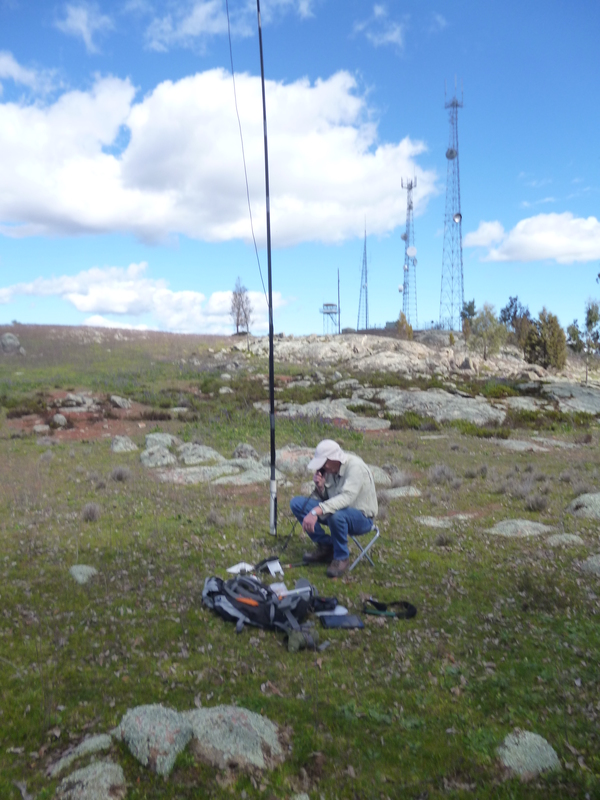 I mean I had worked a few EU(European) SOTA portable stations from my home station but working them from a portable location, running 20watts into just a dipole was quite different. The set up now consisted of the FT-817 plus a small after burner (amplifier) and small SLA battery where, by running the radio on 2.5 watts I could achieve approximately 20 watts output. My first contact was to a non SOTA station up in Queensland and he gave me a 5×7 which at least meant I was getting out. This was followed by Andrew VK1NAM for a Summit to Summit contact. Then I managed an Austrian home station, followed very quickly by another Austrian station but this time on a summit. Wow! I had been hoping to make one of these contacts and here it was. Next came a home station in Moscow who gave me a 5×6 and then things went a bit quiet. I checked my phone for service and was delighted that I had a bar or two so I tried the Rucksack Radio Tool app which lets you know what SOTA stations have been spotted. There I noticed Warren VK3BYD was activating on CW (Morse Code) and also on 20metres. I dragged my tiny key out and quickly gave him a call and despite him being quite weak, he heard me and we managed our contact. This was another first – I had never used CW on an activation before and as it turned out OK, I will definitely try that again. The activation finished with two more Summit to Summit contacts, one into the UK and another one into Austria. By now the rain was coming down hard and so I decided that enough was enough and we should retreat into the comfort of the Troopy and start thinking about tea. After an enjoyable meal washed down with a very nice red, we settled into quite a few hands of four handed 500 designed to be played by two players. Many years back Jeff and I had done some bushwalking and this game was a great pastime then and I enjoyed it just as much now. The wind and rain did not let up much all through the night and in the early morning it fairly pelted down. We were up around 7am and took stock of our situation. Outside it was blowing so hard the trees seemed to be more often at right angles to the ground than vertical. I was pleased the Squid pole had been put away for the night as I am sure it would not have been still up come morning. Further, we seemed enveloped in either cloud or fog and the temperature had plummeted to the point I now had my five layers of clothing back on. It was just like mid winter. Clearly, activating another hill was now out of the question and not only that, we might be still up on this hill until the track had dried out sufficiently to make it safe to descend. A slippery track could easily lead to the Troopy running off the track and and into the bush or worse, over the steep side – neither prospect really interested me, so we breakfasted and out came the cards again to fill in part of the morning. By mid morning the rain had eased but the wind hadn’t abated. This was probably a good thing as it would assist in drying the track or so we thought. Following morning tea at around 11 we decided to pack up and head down. I walked back down the track to see what condition it was in. In this part, most of the water had run off and despite the track having no maintenance for many a year there was a lot of evidence of the original road base. This gave me a bit more confidence at attempting the descent now instead of later. Despite my short walking trip I was still thinking the worst – fallen trees and boggy track. Jeff had suggested dropping the tyre pressures down but I figured that should we encounter a really bad patch, then I would do that. I had planned on just letting the Troopy idle its way down hoping that any slippery patches could be managed at slow speed with the momentum of the truck and gravity pulling us through them. This proved fine and despite taking almost twice as long to come down as going up, we made it safely out onto the Eliott Way and then back to Tumbarumba. Yes, there were a number of very greasy patches but very judicious use of the throttle and gentle steering got us through safely. My fear of having to deal with fallen trees was unfounded as well and other than a small one we encountered on the way up there was nothing additional on the way down. Lunch at the Bakery in Tumbarumba was very welcome. I can recommend their pies to any travellers and the coffee was also worth the wait and then we were on our way home. Unfortunately, I didn’t manage any photos on this trip as any time spent outside the tent was for antenna adjustments and installations – it was just too miserable to spend any more time out than necessary. Another good activation although I do need to carry out some repairs to the Squid pole or purchase a new one. The Mountain Goat award is still a long way off as this activation brought me up to 46 points – only another 954 to go! This entry was posted in Uncategorized on November 18, 2014 by vk2yw. Mt Burngoogee – Saturday 6th September 2014. 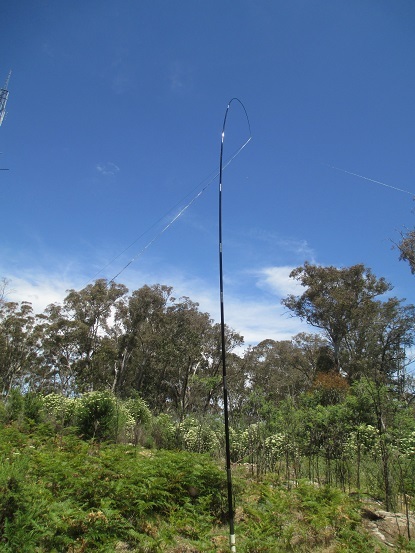 It’s been twelve months now since Summits on the Air (SOTA) kicked off in NSW. To celebrate the anniversary quite a few stations decided to go forth and operate – me being one of them. Initially, I asked Jeff VK2XD to accompany me and he was up for the outing but it would depend on whether his cold improved. It didn’t and he rang early Saturday morning to cancel. That left me with two options – either find someone else silly enough to go climbing hills or go by myself. The latter really shouldn’t be an option from a safety point of view and so I rang Bob VK2VKV at short notice. He was up for it but would confirm at smoko down at the radio clubrooms in a few hours. I left it at that and loaded my pack into the car and set off for the clubrooms. The weather was just perfect – a beautiful spring day. I hoped it would indeed be as good as this on Burngoogee. Now, I must confess that where I thought Mt. Burngoogee was, it wasn’t. I thought Burngoogee was further to the south east from where it actually is. You see, there are two similar size hilltops within a couple of ‘k’ from one another and BOTH have large towers on them. 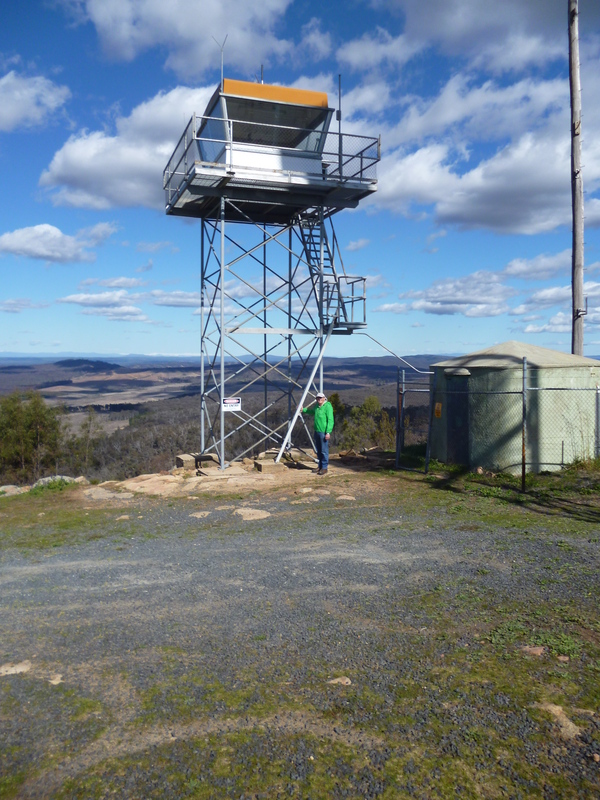 But, Burngoogee also has the Fire Tower on it that featured heavily in this year’s very large bushfire. So, it pays never to assume and always do your homework before heading out on these sorts of trips. I usually plot my track at home on Ozi Explorer and then upload it to the GPS for use on the day. Well, as it turned out, Bob was available and decided it would be a great chance to test his portable setup consisting of Buddipole vertical and FT-817 radio. So after a cuppa at the clubrooms we set off – me with lunch all in my backpack and Bob with a small pack, a Pelican case and his Buddipole gear. I think next activation he might have made up kit in one bag only. Certainly make for easier traveling. The entry, just off the Tumbarumba Road, takes you past the Vietnam Vet’s retreat. Its not really 4WD unless its wet but if you are doing the trip in an ordinary car, it is a dirt road so do take it easy and of course keep an eye for wildlife of the hopping variety as they can do a lot of damage if you hit one. A couple of ‘k’ in there is a turn off to the right and it is marked with a sign indicating Burngoogee Fire Tower. I think its actually called Firetower Road. From here it starts to climb fairly rapidly and has a few man-made contours inserted into the road. I think they must have been old conveyor belts and when I first spied them I wasnt sure they werent made of metal and I even got out to make sure they were rubber. Once on top of the ridge and in sight of the tower you come to a gate with the usual proliferation of linked padlocks. There are no signs saying keep out or ‘Trespassers will be shot’ or words to that effect so we hopped over the gate and set off. The walk quickly gets quite steep and I was soon blowing quite hard but soon we were within a stone’s throw of the summit. The walk from the gate to the top is about 1.8km. I checked the GPS just to be sure that where we picked was in the Activation Zone (within 25 vertical metres of the summit) which we certainly were. Bob set about setting up his little vertical while I laid out the linked dipole and got the squid pole in position. It must have been a few months since I set all this up because I had erected the whole thing and then realised I didnt have the coax connected so back to the ground. Radios work much better when there is more than air connecting them to the antenna! Anyway, soon had that sorted and I was soon on air and making the first of my 7 Summit to Summit contacts. I went on to make 23 contacts in total and all but one on 40metres. 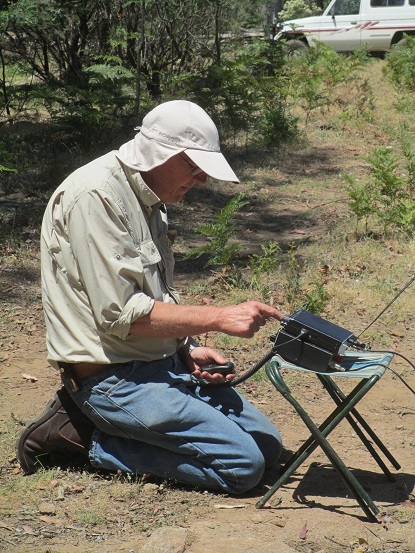 The only other contact was with a VK3IJB/m who was mobile up on Fraser Island. For his 100watts to the mobile antenna I gave him a 5×8 and for my piddly 2.5watts into the dipole he gave me 5×5 so I was quite happy the setup was working. In the meantime Bob made a couple of contacts to test his little setup and whilst he was certainly getting out on the vertical, he couldnt match the signal reports I was getting. The theory is is that more is better. More wire that is. I suspect though, that his antenna would come into its own for overseas contacts, especially up on 20 metres. We must try that out one evening. After a spot of lunch we went exploring and wandered up to the Fire tower which of course is locked. Pretty impressive views from up there…I think that’s part of the appeal, well for me anyway, the views. You could even see significant amounts of snow up on the high country to the east. With the exploring and photos out of the road we packed up and headed back to the car. When we got there we noticed some off road bike guys wandering around. I gave them a wave and they waved back. Next minute they were on the other side of the gate! We headed off but before getting back onto the main track I thought I would just follow this faint track that was heading down the hill and running parallel with the fence. 50 or 60 metres along, the question of how the riders made it onto the other side of the fence became apparent – someone had knocked the fence over and so they had simply ridden across. The break in the fence is not visible from the gate and it looked to me it been down for many months if not years. Having found that we turned back and headed off home. The gear worked well, the walk didnt hurt me …well other than a few stiff joints the next day. It would seem that all my walking is done in relatively flat country so those muscles don’t get any work outs. All in all, another great activation. This entry was posted in Uncategorized on November 17, 2014 by vk2yw. This was one hill I wanted to do! 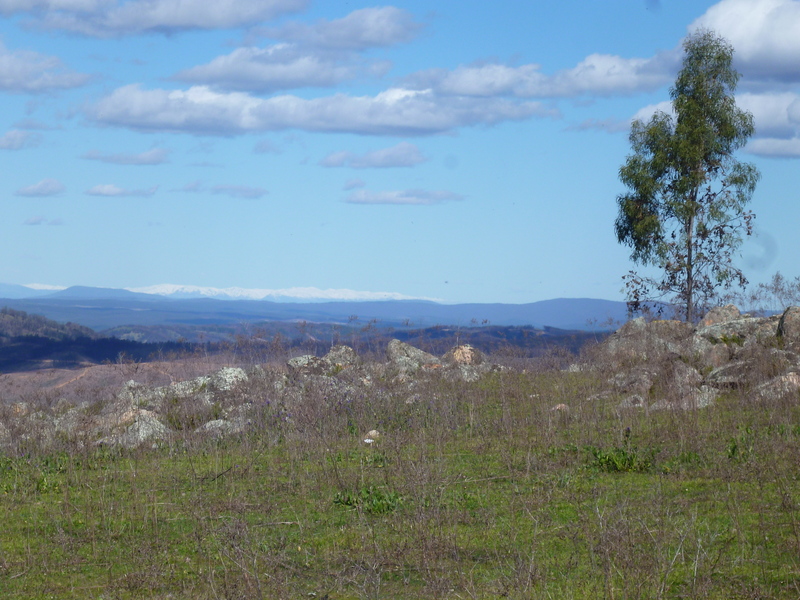 I think it was because it is the number one summit in the Riverina and to some extent it was shrouded in some, well …not mystery so much as not having any up to date information. My maps do not show any track up there what so ever but in speaking to various people it seemed there was a track up there but don’t bother if it has rained recently and it is a very interesting track and not for the faint hearted. Anyway, I saw a window of opportunity for Sunday December 1st and put out some feelers to see if anyone else was interested. As it turned out Bernard VK2IB was free and also itching to have a crack at it as he was turned back some months ago by a very slippery track. Now, I had never met Bernard; we had only ever emailed one another so we planned to meet over coffee at Holbrook on the Sunday morning and then head off to attempt the summit. For coffee in Holbrook there are a number of options but mostly for me its at the Bakery in the middle of town but unbeknownst to me the Bakery has an outlet on the southern end of town just near where the Hume bypasses the town and it was here we decided to meet. First impressions are always good I think and given our common interests we seemed to hit it off from the start and were soon discussing tactics for the ascent, along with coffee. About forty minutes later we set off in our separate vehicles – he in the unbreakable Hi-lux and me in the Troopy. I was convinced we could do little wrong with two Toyotas. 🙂 I had been told to look out for a new track to the top and so all the way down Millers Firetrail I kept my eyes out but to no avail and so we made it down to the beginning of the Jingellic Trig road with little problem. There was the odd pull up to remove fallen timber (being behind I did very little) and we did notice there had been little traffic down it. Now if you decide to walk to the summit then the beginning of the Trig track is where you might start because it is very steep from here on so if you are in anything else other than a decent 4WD this is where you start walking. I stayed in 4WD 2nd gear Lo Range all the way up. The first corner is a doozie – the Troopy took three bites at it to get around. There was a lot more fallen timber on the track but nothing that required a chainsaw although we were both carrying them in case. Bernard erected his dipole with the centre at about 6 metres whilst my ‘doublet’ was at around 8m and at right angles to him. I suggested he go first to activate the summit which he did and I then went on to activate it using his gear. Once we had exhausted chasers we knocked off for lunch and re-commenced from my station on 20 metres. I could only raise Paul VK5PAS who was easily 5×9 to me but he was the only station we could muster so we went back to 40 metres to do the comparisons. From the comments it seems the ‘doublet’ is as good as the linked dipole but seems to suffer from some fast fading although not in all directions. I am not sure really what to make of the results as they were fairly subjective but the fast fade was consistent with other reports I have received in the past for this antenna. None the less, I will be keeping the configuration as the ease of operation all the way up to 10 metres is just great. I may go a step further yet and make a modified version of the G5 to see if I can eliminate the tuner. More on that at a later date. Just after 3pm we decided to call it quits and head back to Holbrook for coffee and then off home. We set off back down and noticed a track running off to the left a few hundred metres down. This track was marked as Mt Paynter Firetrail and so we decided to investigate it to see if it was the new track. Again, there was little sign of use but we didn’t encounter any fallen timber. In fact this track is much shorter and although still very steep in places it seems to be a better track. When we came out at Millers though we noticed a sign indicating that it was for authorised vehicles only – we both wondered why as there was nothing secret along it and it was certainly both shorter and generally in better condition. Ahh…you have to love the NPWS 🙂 . It would though be a much better walking track and if you are contemplating this summit and you are going to walk it then this is the place to start. Back at Holbrook around 5pm we discovered that the Bakery at the southern end of Holbrook closes before 5pm so we said our farewells here and set of in opposite directions – Bernard to Albury and me to Wagga. All in all a great day’s outing – good coffee, good company, great 4Wd run and radio – what more could you ask for?